Individual MOS-FET power amplifier modules supply the power for Icom's most powerful dual band mobile with 55W/50W (VHF/UHF). Stable power for long distance communications plus reduced power settings (15/5W) for local communications. See why Icom has a world renowned reputation for superb wideband receivers with the IC-208H. The IC-208H wideband receiver covers 118-173, 230-549 and 810-999MHz* as standard. Listen to your Amateur VHF/UHF bands, as well as aviation, marine, weather and other utility communications in a compact mobile package. 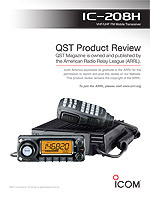 Extends your mobile radio enjoyment! Limited installation space is no problem with the IC-208H. The separation cable, OPC-600/R, is supplied with the radio allowing the compact remote control head* to be installed almost anywhere. * 111 (W) × 40(H) × 26.3 (D) mm; 43.8 × 19.16 × 11.32 in. With this much memory, you can fill your IC-208H with your favorite frequencies and operation settings such as output power, tone, and more! Then name each memory channel with up to 6 characters for quick channel identification. The improved DMS system allows you to scan all the selected banks you want to scan by simply adding/deleting bank links with Icom's exclusive Bank Link system. Yet another convenient feature to make the IC-208H more practical radio. The large multi-function tuning knob provides intuitive channel tuning or band hopping. The multicolor display lighting and backlit buttons adds a new "fun" dimension to operating the IC-208H. The supplied HM-133 remote control microphone allows you to control almost every function of the IC-208H from the mic.